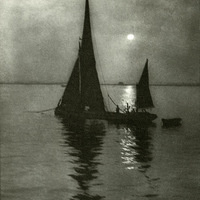 Coburn studied and embraced photogravure, a photomechanical process using printer's ink, and not only supervised the printing but also set up two presses in his London home. He prepared and etched every steel plate, inked them with hand-ground pigments and experimented with various papers before he released a proof to his printer. The photogravures in this exhibition represent three of Coburn’s series, London (1909), New York (1910), and the illustrations to H. G. Wells’ The Door in the Wall (1911).